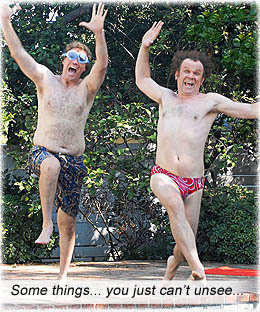 Will Ferrell as Adam Sandler and John C. Reilly as a funny Will Ferrell. Both 40 going on 14. Both thrown together as step brothers when their single parents (Richard Jenkins and Mary Steenburgen) marry; set in their ways, yet forced to share the same house, they must somehow find a way to co-exist – or this mixture of funny, half-funny and deadpan stupid gags would all go to waste. Splash review on the DVD box for STEP BROTHERS, from Kyle Smith, New York Post: “The funniest film I’ve seen this year.” You don’t get out much, do you, Kyle? Movie opens with a quote onscreen: “Families is where our nation finds hope; where wings take dream.” The credit reads: “an actual quote from George W. Bush.” Rather than pushing any political stance, I think this movie is trying to tell us it’s going to be about a couple of mongoons. There are a few good lines, all said by someone other than Will Ferrell, but if you enjoy this movie without being whiskied up enough to put a mule-deer into a coma, you’re probably related to him. Writers: Will Ferrell, Adam McKay, John C. Reilly. Starring: Will Ferrell, John C. Reilly, Richard Jenkins, Mary Steenburgen, Adam Scott, Horatio Sanz, Gillian Vigman.